The Dagenham Ford sewing machinist strike of 1968 is widely accepted as a pivotal moment in the pursuit of gender equality in the UK. Prompting the passing of the Equal Pay Act 1970, the strike originated from the decision to downgrade the machinists from skilled to an unskilled grade, which left the women’s pay even further behind their male counterparts – when under the existing rules the women still only got 87% of the pay of the men at the same grade. The women break convention to take a stand and go out on strike, but with their husbands also employed at the Ford plant, and management turning to dirty tactics to get them back at their machines, can the women – and their relationships – hold their nerve? As a piece of British history, and one that’s subtly altered the lives of such a huge proportion of the population, seeing it transformed into a West End musical is just fantastic. It’s unusual and incredibly exciting to see a female lead, and even more so a female lead playing as strong, opinionated and influential a woman as Rita O’Grady (Gemma Arterton), the figurehead for the action. Arterton leads the cast well, convincing as a “Busy Woman,” though sporting a Dagenham accent slightly incongruous with the rest of the cast. But what’s most noticeable in her character is that she’s not emasculated in order to become such a strong leader, testament to the writing by Richard Bean (book) and William Ivory (Made in Dagenham film). It’s not just the depiction of Rita O’Grady that’s impressive about the writing of this musical; saturated with cultural references, from Babycham to Brown Ale, the script and lyrics (Richard Thomas) are sharp and funny, sometimes close to the line, other times over it, but the kind that you feel you could watch the musical 5 times in a row and notice different things to laugh at every time. Stereotypes galore, Rita’s husband, Eddie O’Grady (Adrian der Gregorian) measures his relationship in football seasons, his wedding anniversary committed to memory by reference only to Millwall matches. The unskilled worker-management tension is encapsulated perfectly in the rivalry between their teams, Millwall and West Ham, a dimension that’s only touched upon but that fits as though bespoke. Over in Westminster, the politicians also conform to stereotype, a visible caricature spouting relentless jargon and championing beaurocracy, but above all practicing what they preach when it comes to misogyny. The depiction of misogyny is a potential minefield in a musical like this; it’s a critical element both to the plot and the motivation of the characters, and whilst uncomfortable, it’s done in a way that really does point out the ridiculousness of such anti-female attitudes. Balancing this to a certain extent is the pisogyny that’s almost as pervasive, a reminder that sexual harassment in the workplace can be against either gender, though it does feel a little too accepting and not quite mocking enough of the anti-male sentiment. The gender roles and social positioning are reinforced through utterly brilliant set design. It’s strange to come out of a theatre thinking, “what an incredible set,” but that’s precisely what designer Bunny Christie has achieved. The delicate balance between the obvious and the metaphorical is struck, echoing lyrics dense with fiercely British irony; management quite literally sit drinking tea in their office above the machinists, politicians decree from inside the face of Big Ben, and the extensive use of projections add a dynamism that’s quite unique to the production. The songs, whilst not life-altering, are sufficiently catchy, particularly the finale song “Stand Up,” which is an unashamed plea to the audience to get on their feet (which, of course, works a treat). Despite the musical as a whole lacking in genuine emotional intensity, there are flashes of emotion in the stunningly-executed harmonies of “Storm Clouds,” which is beautifully understated and poignant, reinforced by strong staging. It contrasts brilliantly with “This is America,” which delivers a rare burst of energy, and is yet another example of brilliant lyrics, though the rock-inspired delivery is excellent in concept but less so in execution. 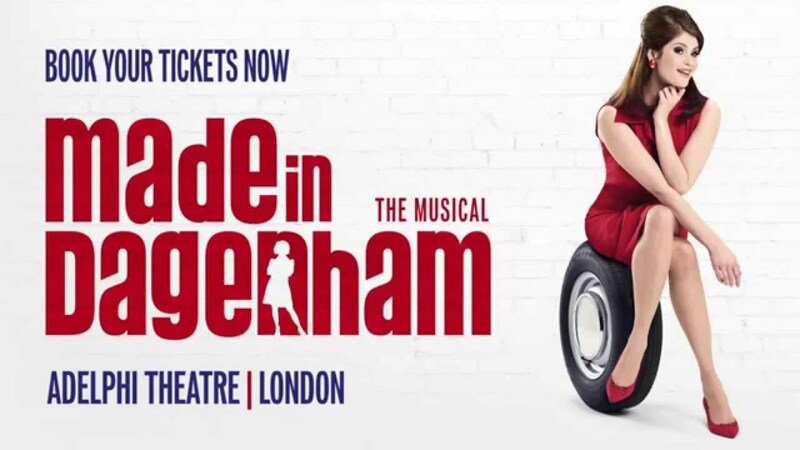 Like the components of the Ford Cortina, Made in Dagenham doesn’t exactly break the mould, but it certainly stretches it. A wickedly funny new British musical, it’s one that you’ll come out of with a smile on your face, feeling strong, defiant and empowered.